Have you ever heard of Spoonflower? I discovered them when I was searching for a specific pattern for a fabric I wanted to use to make my nephew a baby blanket. His mom and dad love the abominable snowman aka Yeti. 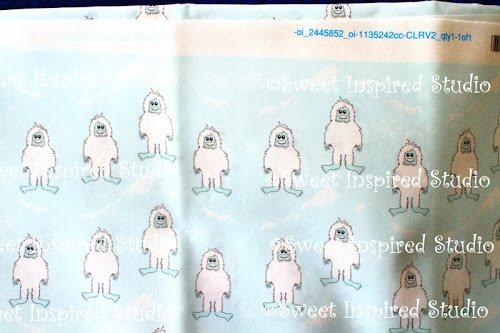 I searched for a fabric with Yetis but the ones I found were too girly or too mean looking. I wanted a friendly cute Yeti. Then I stumbled upon Spoonflower.com and found that I could create my own design and send it into them to print onto fabric! I can't draw. Let me repeat, I can't draw, but I thought it wouldn't hurt to give it a try. After spending a few hours messing around on the digital drawing pad, I finally created something I liked! Here he is! I put him against a background of snowy mountain tops. 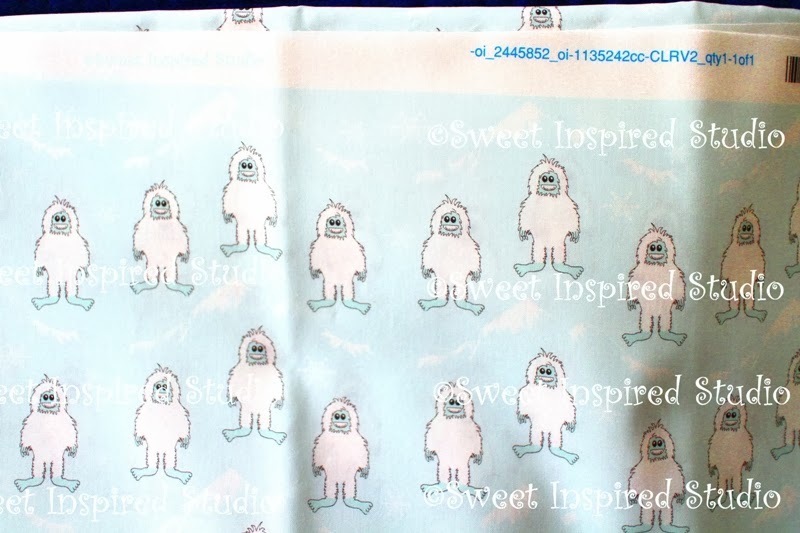 I uploaded the drawing to Spoonflower.com and ordered a yard of the fabric. It was very reasonably priced, only around $18 for the yard including shipping. Here is the fabric that I received. I paired it with a blue and white stripe fabric and a snowflake fabric for the binding. On the back I handstitched a "V" for Victor. 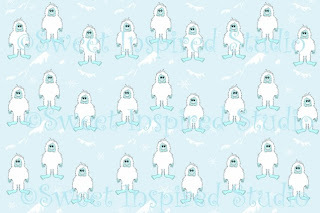 So if you ever want to design your own fabric, I highly recommend Spoonflower! I promise no one is paying me to say that! Another great thing about their site is if you allow your design to be "Public" and allow other people to use it, Spoonflower will give you 10% of their purchase price. I haven't decided if I want to do that yet. 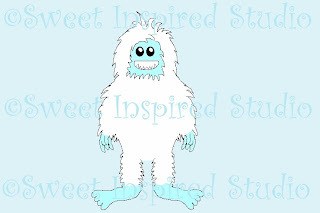 I am now working on turning the abominable snowman into Bigfoot! 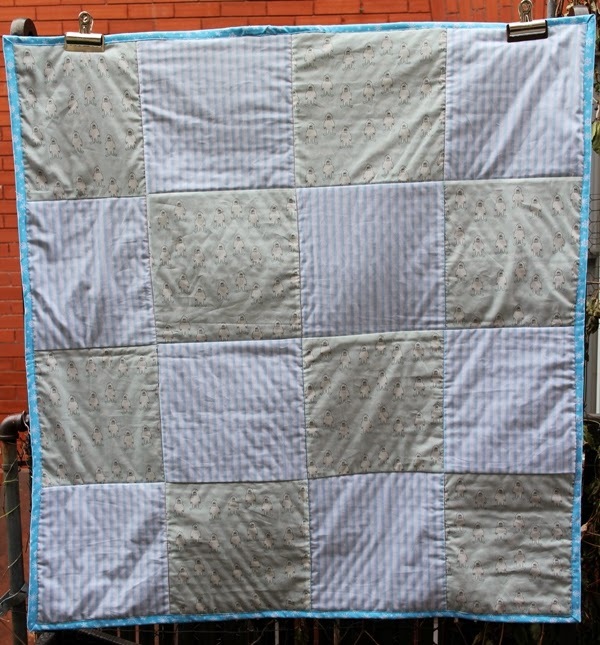 How fantastic, & what a beautiful original quilt, that I'm sure will be treasured and passed on & on. I do not sew, but that is so cool that that can be done! Thanks for sharing the cute fabric!!! That is awesome. I love the idea that thanks to that idea your quilt is absolutely unique! Amazing, Khammany!! Your very own patented design, fantastic! It looks lovely. You are fast becoming a little entrepreneur, my friend! Khammany, The Yeti pattern that you created is darling. I had no idea you could custom design a fabric so easily and really at a reasonable cost. I will be bookmarking this page for future reference. The blanket for your nephew is precious, you did a beautiful job on it. And of course no one else will ever have one just like it! Perfect! !